Jimmy Butler tried to drag the Sixers to a Game 1 win, but didn't get much help against Brooklyn. 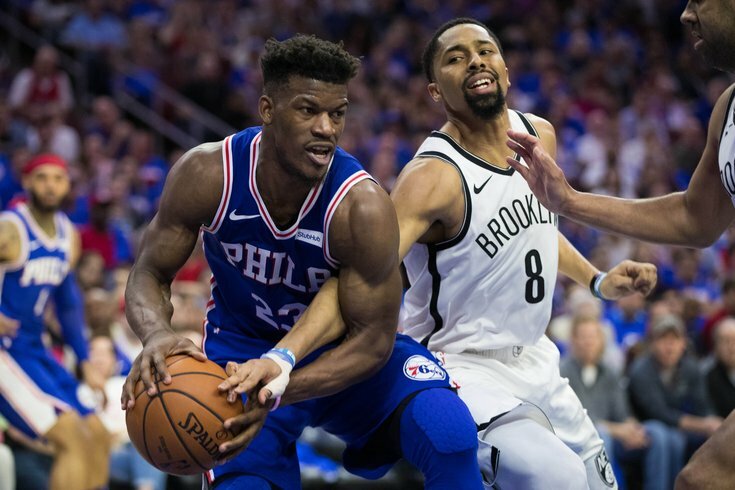 Philadelphia 76ers guard Jimmy Butler (23) drives the lane as Brooklyn Nets guard Spencer Dinwiddie (8) reaches for the ball during the second quarter in game one of the first round of the 2019 NBA Playoffs at Wells Fargo Center. Sixers fans have been waiting for months to see if the team actually had a switch to flip between the regular season and the playoffs. Jimmy Butler proved he does with a monster effort in Game 1, but we're still waiting to see if the rest of the team will show up after a 111-102 defeat that truthfully wasn't as close as the score seems. Mailbag: Will the Sixers change their defensive strategy to stop Nets' guards? • As far as in-arena experiences go, playoff basketball is a delight. Between Ron Brooks singing the national anthem, the fans showing up loud and proud, and the anticipation for some real basketball, this time of year is just different. Glad we finally got here. • If you were expecting Joel Embiid to ease his way into the game, boy have you not paid much attention to the season this guy is having. Philadelphia absolutely hammered the Nets inside early in the game, with Embiid overwhelming the Nets inside as he has done all season. People who only see the Nets play when they face off against the Sixers might be surprised to learn this, but Jarrett Allen is pretty damn good as a young center. But he's giving up far too much weight to slow the big fella down, and if he bites on any of Embiid's pump fakes or post moves, he has an even worse time. The Sixers drew three fouls on Allen in the first eight minutes of action, and credit goes to Jimmy Butler for engineering the third one by driving straight at Allen's chest and forcing the refs to make a decision. Philly was the much more physical team early, and they reaped the benefits of that style of play. • Credit where it is due — I expressed a lot of skepticism about Boban Marjanovic in a playoff setting, as we've seen him struggle to deal with bigs of all sorts on the defensive end. But he was the first big man off of the bench on Saturday, and he helped the Sixers out at either end of the floor. As much as I've lampooned the Sixers for having too many centers on the roster — and that remains true! — sticking with Boban has already helped them in this series. Honestly, he may have been their... second-best player in this game? Embiid was often great at putting out fires on defense, but he was clearly hobbled and not his usual self. In any case, the Sixers are going to need the best of Boban in this series, because it does not look like we're going to get apex Embiid at any point. • If you were waiting for months for Jimmy Butler to show up in full playoff form, you were treated to quite a performance on Saturday afternoon. This was the best possible version of Butler — an intense, relentless, foul-drawing machine who did everything in his power to keep the game close for Philadelphia. The Sixers' shooters were absolutely horrendous early on in Game 1, so it was up to Butler to manufacture offense on his own. A lot of it came through hunting offensive rebounds, where Butler just refused to let the Nets come down with easy boards after misses. Even when he didn't haul them in, he was making Brooklyn fear him swooping through the air, and he thrived within the chaos. Butler comes and goes during the regular season, but the one thing you can say about him is that when it's time to stand up and be counted, he is there with his chest puffed out ready to live with the consequences. You need guys who are wired like that to win in the playoffs, and it's even more helpful when one of your best players has that personality. He loves to tell you how much he cares about winning, and on Saturday, you could see that everywhere. The emotion on his face, the way he fought on every possession, the way he dug out some loose balls and stayed engaged away from the ball on defense. That was a statement game. However, the Sixers losing with Butler playing that well is not exactly an encouraging sight if you're expecting Philly to win the series. • I can't blame Jonathon Simmons for looking out of sorts on the floor when he hasn't played real rotation minutes in a long time. I can absolutely blame the coach for putting him out there when he hasn't been used in the rotation for a long time, especially when he never showed much there when he was given a chance in the first place. To say the Sixers got run off of the floor when Simmons is out there is kind to how they looked every second he played. Simmons checked in with the Sixers up 22-19 in the first quarter. He left with the team down 37-23. There's no real reason he should be given another chance to play in this series, unless there's an injury to someone else in the rotation. He was that bad. Again, we've all known this for some time. That Brown is incapable (or unwilling) to see this is no one else's fault but his. • It was not a banner afternoon for anyone named Simmons, while we're on the topic. Ben Simmons is a much more consequential piece than the bench counterpart, and he looked as lost as he did at times last postseason in Game 1 of the first round. That we have already arrived here in Game 1 of the first round, against a team less equipped to deal with Simmons than any team they would face past this round, is extremely bad. To an extent, this was always going to be a story to watch for Philadelphia in these playoffs. But the Nets are a guard-heavy team, and Simmons should at least be able to impose his will physically. He didn't even come close to doing that. Simmons may be built like a power guy, but he tries to play as if he's a finesse guy, and I think everyone is aware his skill level (sans his passing ability) is his primary weakness. His touch is bad around the rim, and that makes him susceptible to games like these when the paint gets crowded and the game gets more physical in the playoffs. • That shooting slump Tobias Harris has been in from deep did not end as soon as the playoffs started, as it turns out. He has proven he is much better than this over years of work, and the Sixers need that version of him, not this off-brand edition that settles in as an average three-point shooter. There has been a (sort of strange) assumption that he's just going to automatically get a max offer from somebody this summer, forcing Philly's hand in that department. Are we sure that's the case? He's a young-ish, sub-star player, but he has never proven anything in a playoff setting and he's very clearly a secondary piece. Brooklyn tortured him on the defensive end a decent amount, and his true colors have shown on that end over time. For all the potential downside with Butler, at the very least he has a track record of showing up when it counts. It's up to Harris to prove in these playoffs you can say the same about him. Game 1 was not a good start. • I'm sure Sixers fans could have done without another postseason of Redick missing key shots and getting roasted on the defensive end, but that's exactly what they got to start the series. It's going to be a very short trip if he's as bad as he was on Saturday. • Embiid certainly had his flashes, and on defense, he was an absolute difference maker. But you can see that the pre-game concern about his health was not a ruse to throw off the Brooklyn gameplan. At times on Saturday, he was walking pretty gingerly up and down the court, and you could see the pain on his face when it was really flaring up. They are going to have to win this series one way or another, but it looks like they're going to have to do it with their cornerstone at less than 100 percent. • I know the Sixers are trying to make their money in any way possible, that's the American way, but there's probably something to be said for not playing loud, obnoxious music and running through ridiculous sponsored segments while the team is getting their asses kicked in the fourth quarter of a playoff game. It's a basketball game, not the goddamn circus. • The fans had no tolerance for Simmons' failures on Saturday afternoon. When guys are playing hard and coming up short, that's a situation where I don't think booing is helpful. Simmons earned every last one of those boos from the home crowd. He was inattentive, lazy, tentative, and every other negative adjective you could throw at him. We will get to the bottom of this after the game. If there's some kind of family emergency, that's the only real excuse. Otherwise, that about sums up the game.